I also paired with it a piece that belongs to one of my more recent obsessions; fun/coloured faux fur accessories. This red and purple ombre, stole had been sitting in my wardrobe for a couple of years until it tumbled out whilst I was rearranging a few things, so I decided to resurrect it. Although it's old, fear not - I've linked a few alternatives below if it takes your fancy. 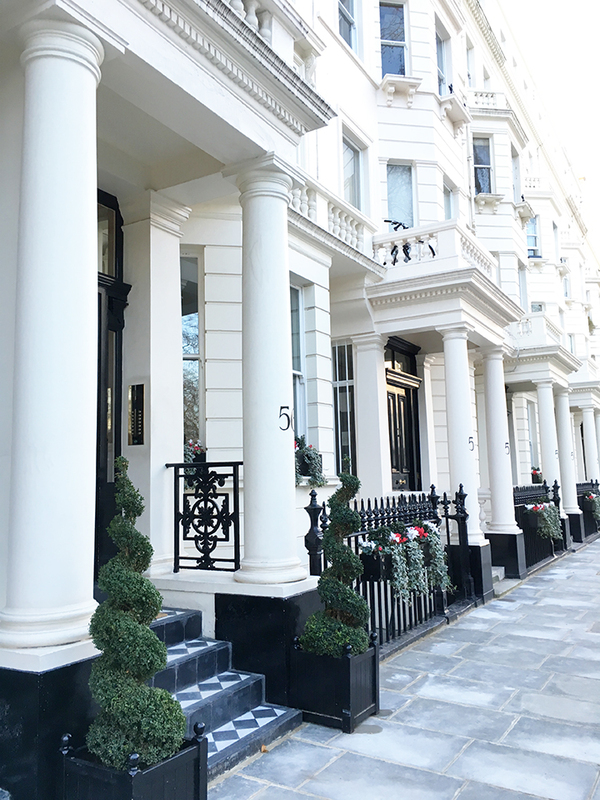 It seems strange writing this whilst looking at the photos of me all bundled up in London, as I'm currently writing this to you from sunny Singapore! If you'd like to see what I'm getting up to you can take a look at @arabellagolby on Instagram and Twitter. Are you a fan of fun faux fur? Do you have a black coat that goes with everything? Coat: here. Jumper: sold out/not online - alternative here. - both c/o Marks & Spencer. Boots: here. Skirt: Zara - £16 alternative here. Brooch: Chanel. Earrings: Dior. - alternative here. 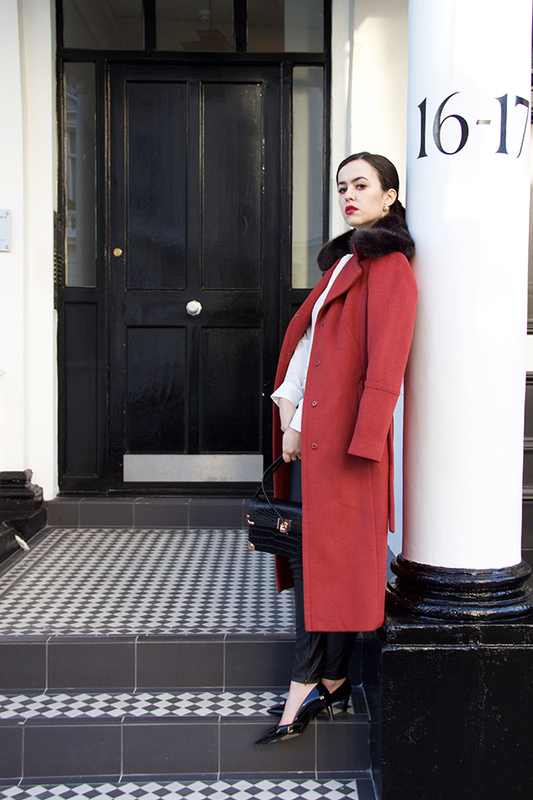 Next up; red - the second installation of my 3 part Statement Coat series. 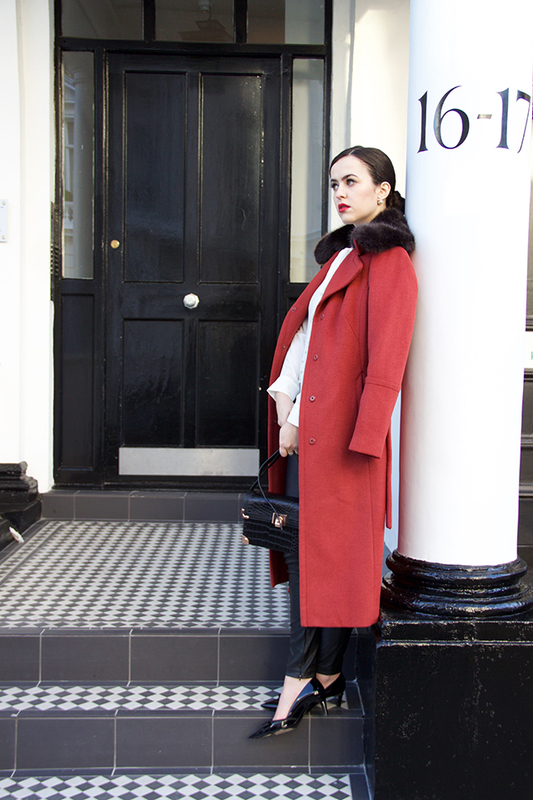 Brightly coloured coats are something I find quite timeless - as long as the style and cut is classic. This jewel toned M&S piece is certainly an eye catcher and encapsulates everything I love in a coat; statement lapels, bold colour and a maxi length. 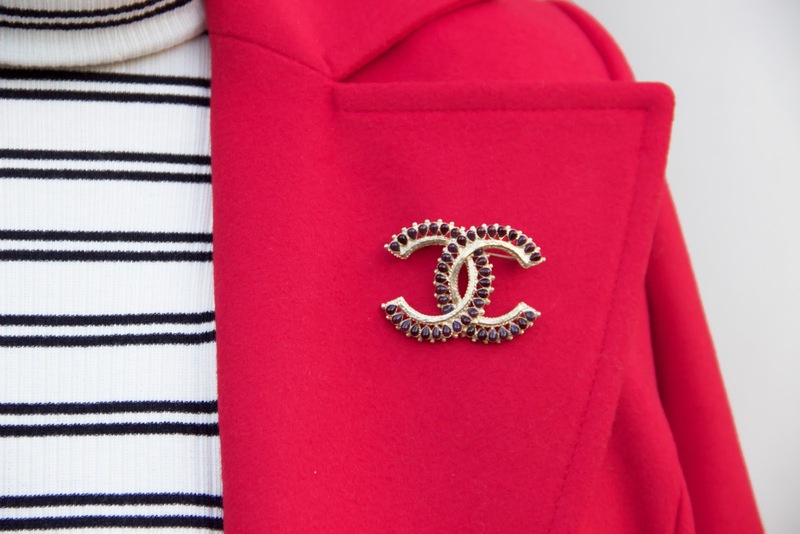 I wanted to go for a sort of smart casual, Parisian vibe, so I paired it with a striped roll neck and a Chanel brooch with deep red jewel details. 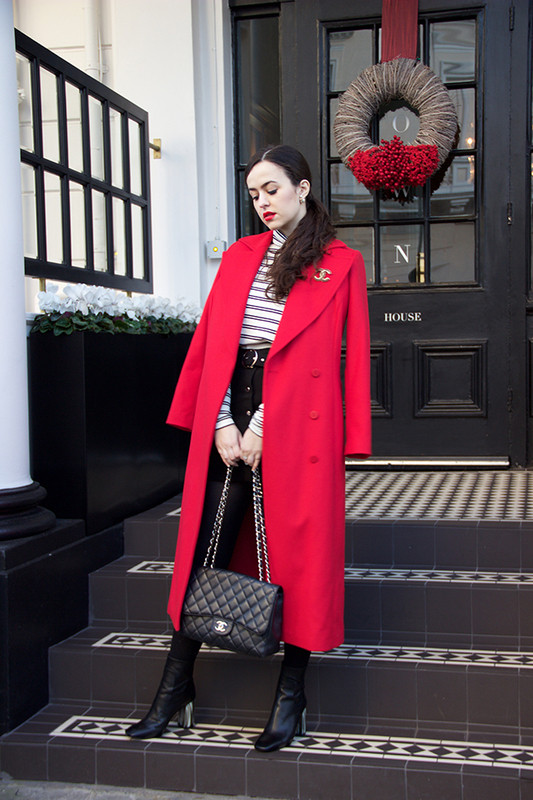 Do you have any super colourful coats in your wardrobe? Coat (in the sale! ): here. Blouse: here. 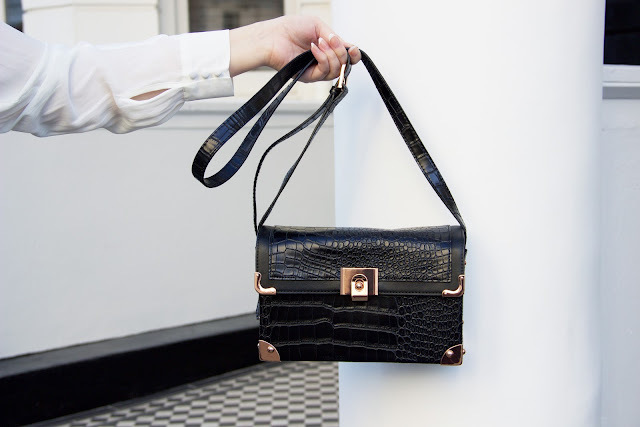 Bag: here | all - c/o Marks & Spencer. Shoes: Russell & Bromley. Trousers: here. Earrings: Dior - alternative here. 'Tis officially the season, and by 'the season' I mean the season for shamelessly updating your coat collection. I am, and always have been a complete coat fiend. I am that person who has a rail exclusively for coats, and this is something I'm mostly proud but also a little ashamed of. Statement coats are my particular weakness because they are, in my mind at least, an entire outfit in themselves. Throw on a pretty basic outfit and top it off with a bold, eye-catching coat and you're good to go. My favourite failsafe combo is a blouse or polo neck jumper teamed with a pair of leather trousers. Marks & Spencer has been a longstanding and rather unexpected favourite of mine when it comes to outerwear, and many of my oldest coats that've stood the test of time are from M&S - my personal fave being this pinstripe one I wore to fashion week a couple of years ago. I've also found that my answer to the question 'where's your coat from?' is met with the most surprise when I reveal it's from M&S. Literally, I don't know why this isn't public knowledge. M&S do great coats and I've always thought so. So, when M&S offered to help revamp my winter wardrobe my response was... oh my god YES. I picked out a few, a russet one, a red one and a black one, which I'll be sharing with you over the next week or so. This one is almost certainly my favourite (FYI it's also reduced from £129 to £90.30) The russet colour is so striking and unusual, which contrasts perfectly with the jet black collar. I'm also really pleased with how well it's photographed - I think the rich, warm colour really comes across wonderfully. What do you think? Do you like wearing coloured coats or are you more of an 'all black everything' person? 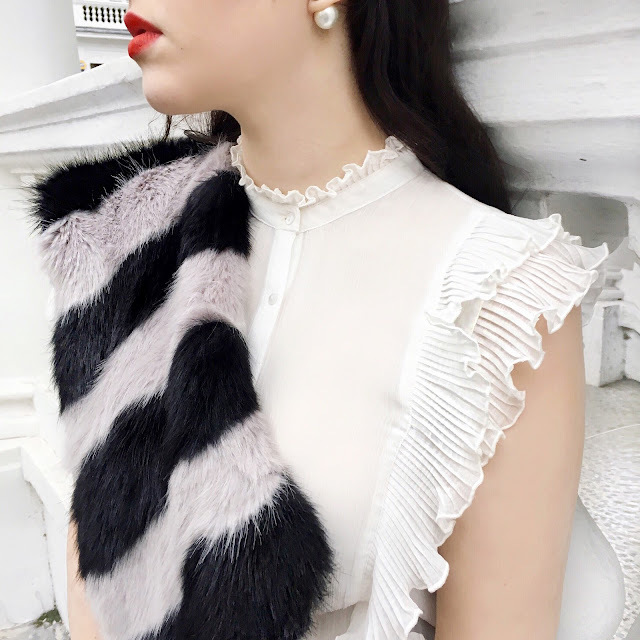 Faux Fur Stole - here. | Coat - here. Earrings - Dior, alternative here. 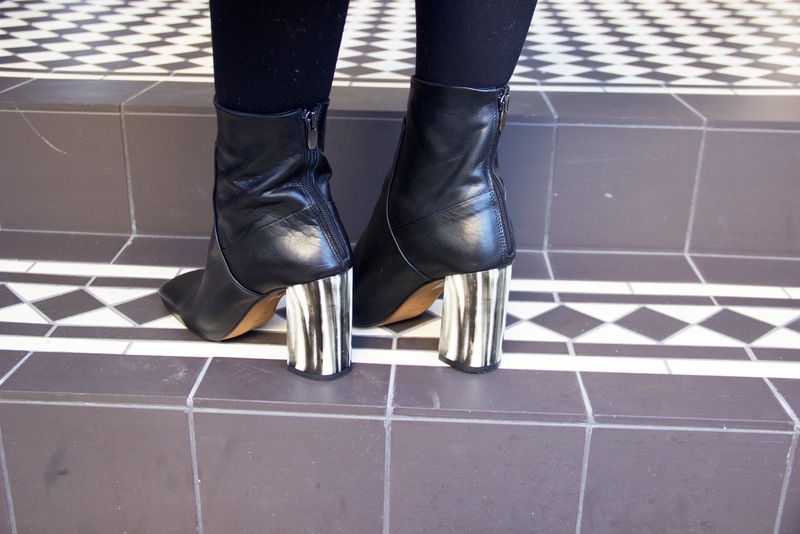 | Shoes: Russell & Bromley, sold out, alternative here. Bag - Chanel, alternative here. 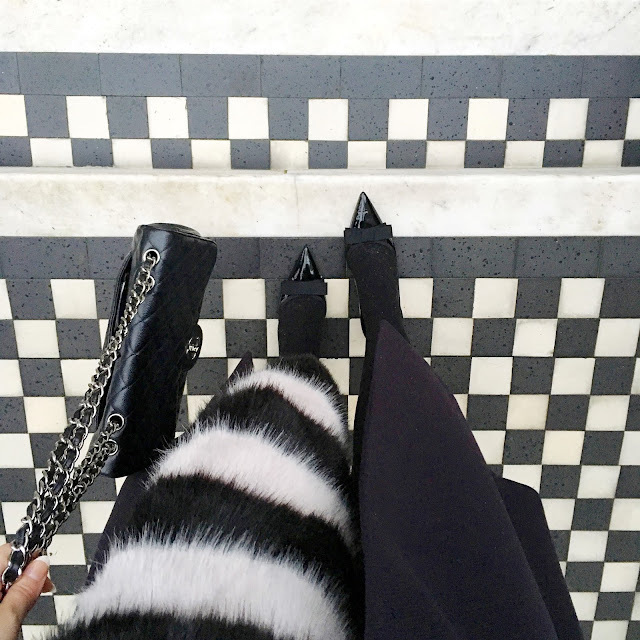 Another failsafe monochrome outfit to share today, snapped on the day before my birthday whilst picking up a couple of presents and jazzed up with my new favourite winter accessory; a striped faux fur stole from Reiss. The fact that the light stripe in the scarf isn't white, but a beautiful grey-lilac, avoids the potential 'style inspo: Cruella De'Ville' situation. I picked up this coat (which makes me feel a bit like I'm in The Matrix so that's great) after realising that I actually didn't own a plain black coat - only black capes, and quite frankly my lower arms were growing tired of always being cold. So, I decided to get myself a warm, practical, versatile coat with actual proper arms. I'm not always the best at dressing practically for the cold, I tend to peer out of the window and think 'nah, it doesn't look that cold, I'll just wear a light jacket.' This decision is swiftly followed by regret. Shivery regret. Because of this, I've really been enjoying making use of these two new winter-appropriate pieces.